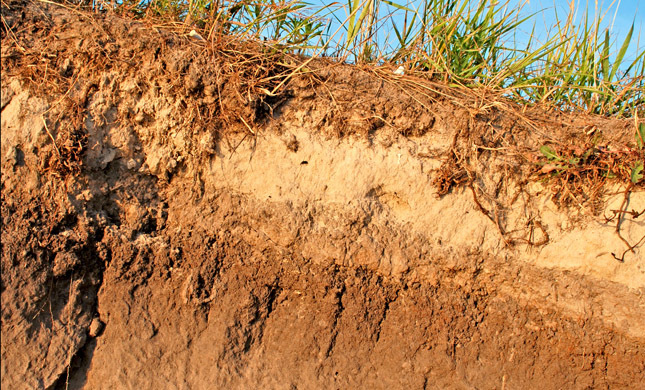 Soil covers much of the land on Earth. It is made of air, water, minerals, and waste from plants and animals. Some soil minerals are sand, clay, and silt. Soil is also called dirt or earth. Soil is made up of layers called horizons. The top is dark, rich humus. Next is the topsoil layer where plants grow best. The subsoil later contains minerals like clay. The bedrock horizon is last. Soil is not as solid as rock. It has many small spaces, called pores, that hold water and air. In some places on Earth, a thin layer of soil only 6 inches (15 centimeters) thick lies on top of rock. In other places, though, soil may be hundreds of feet deep. 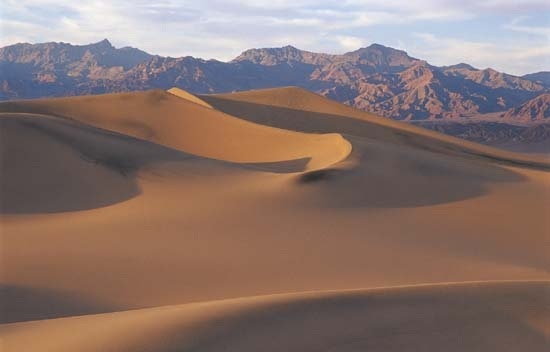 Sand is made up of small, loose pieces of rock, soil, minerals, and even gemstones. It may also contain the remains of living things. ﻿Nature forms sand constantly. Tiny chips of rock are always breaking off from boulders, cliffs, and mountainsides. As the weather and water wear down the chips, they create sand. What type of soil do you have at home? Humus will hold its shape, them crumble with a poke. Clay will hold its shape even when poked. Sand will not hold its shape and will fall apart when you open your hand. "Britannica School." Britannica School. Encyclopedia Britannica, n.d. Web. 08 Oct. 2014. "PebbleGo | Capstone Digital." PebbleGo. Capstone Digital, n.d. Web. 08 Oct. 2014. "The Robert Treat Farm in Milford Connecticut . Authentic Family Farm and Garden Center . Farm Share Program in Connecticut." The Robert Treat Farm in Milford Connecticut . Authentic Family Farm and Garden Center. Farm Share Program in Connecticut, n.d. Web. 08 Oct. 2014. "Types of Soil Clay ,Sandy , Kids Learning Animation Video Tutorial."YouTube. YouTube, n.d. Web. 08 Oct. 2014. Ware, Lauren. "Know Your Soil." About. About Home, n.d. Web. 08 Oct. 2014. "What Soil Type Do You Have? 3 Ways to Find Out - DR's Country Life..." DRs Country Life Blog. Professional Power Done Right, n.d. Web. 08 Oct. 2014. Young, Doris. "Third Grade Thinkers: Types of Soil Investigation and Printable." Third Grade Thinkers: Types of Soil Investigation and Printable. Blogspot, 7 May 2012. Web. 08 Oct. 2014.